Article’s theme: Thyroid hormones, hypothyroidism, hyperthyroidism, and key risk factors. Thyroid is one of the most critical glands for human well-being, particularly during pregnancy and childhood. Today, thyroid disease is a global health problem that impacts a significant population—including those in advanced economies despite widespread testing and continuous lowering of treatment thresholds that has brought significant awareness. Even in iodine-sufficient areas thyroid dysfunction is fairly common due to thyroid autoimmune diseases. The key role of thyroid hormones is metabolism control. They are also critical for neurological development of newborns, growth in childhood, and reproduction. Iodine is key to maintaining thyroid health as almost 75% of the iodine in body is used by thyroid gland. Iodine supplementation in human diet remains a hot issue despite salt-fortification across the globe. Resurgence of thyroid diseases in many previously declared iodine sufficient regions has been alarming. More from our blogs: Thyroid and Pregnancy – how thyroid impacts pregnancy | Thyroid and Iodine – understand the role of iodine in thyroid health | All About Thyroid – brief summary of thyroid disorder, deficiency symptoms, and more | At Home Thyroid Test – a test that measures TSH, free T4, free T3, and TPO. Both high and low iodine supplies negatively impact health, however, two-third of the world is naturally iodine-deficient. That’s why almost 120 countries mandate iodine fortification of dietary salt to ensure adequate supply. In general, coastal areas with marine food supply seem to have adequate or high iodine supply in their food. The role of thyroid in every day health is well recognized across the world. Despite a high degree of awareness, thyroid disease is a global health problem, particularly during pregnancy and childhood. In US alone, it is estimated that approximately 6% or 18 million people have some form of mild or serious thyroid disorder (NHANES III 2002). About 80% of these cases are due to low thyroid hormones, or hypothyroidism. The remaining cases are due to hyperthyroidism, a condition of high thyroid hormones. The hypothalamus-pituitary-thyroid (HPT) axis controls thyroid health. Hypothalamus senses the thyroid hormones and releases TRH (thyrotropin-releasing hormone). Pituitary gland senses TRH and releases the thyroid stimulating hormone (TSH) which directs the thyroid gland to release two hormones: thyroxine (also called T4 due to four iodine atoms in it), and tri-iodo-thyronine (also called T3, converted from thyroxine after loosing one iodine atom). Any issues with this closed loop will result in thyroid problems. Hypothyroidism (underactive thyroid) and hyperthyroidism (overactive thyroid) commonly arise from pathological processes in the thyroid gland (and therefore termed primary thyroid disease), although in rare cases, they can arise from disorders of the hypothalamus or pituitary (called secondary or central hypothyroidism) or other from peripheral causes, such as ovarian tumor (struma ovarii), or thyroid cancer. Since the T4 and T3 release is triggered by TSH, first step in diagnosis is checking the TSH levels. Insufficient hormone release by the thyroid gland triggers hypothalamus to oversupply TSH to boost T4 release. 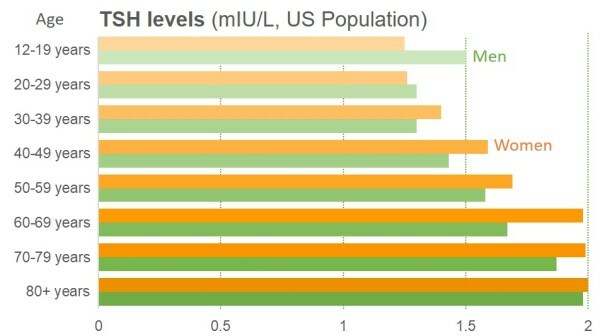 TSH levels above 4.5 mIU/L (milli-international-unit-per-liter) are termed as hypothyroid. In contrast, excess T4 will underdrive the TSH levels, and levels below 0.1 mIU/L result in hyperthyroid. The low or elevated TSH levels are warning signs of a potential thyroid problem. As long as the T4 levels are within healthy range, the conditions remain sub-clinical and may not be a full blown thyroid problem. When the thyroid gland can not keep up with TSH levels and still underproduces or overproduces, the potentially serious conditions are called clinical or overt stage of thyroid diseases. 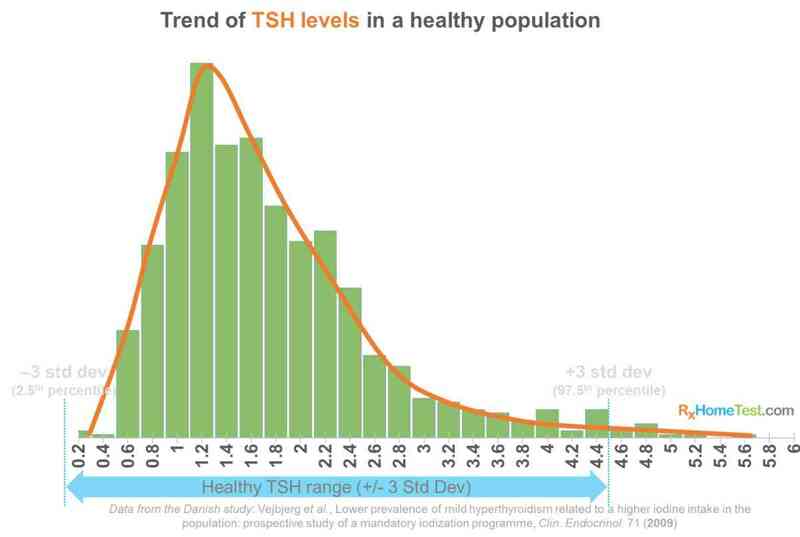 T4 levels below 57.9 nMol/L (nano-moles-per-liter) with high TSH is termed clinical hypothyroidism. On the other hand, levels above 169.9 nMol/L are termed clinical hyperthyroidism. The clinical state that results from too much thyroid hormone in the body. In the overwhelming majority of cases, this is due to excess production from the thyroid gland (hyperthyroidism). As of 2016, 110 countries are now classified to have an optimal iodine supply in diet, while insufficient iodine intake persists in only 19 countries (as per Iodine Global Network Annual Report 2016. http://www.ign.org/). Iodine fortification of all food-grade salt is now mandated in ~120 countries (Dasgupta 2010). However, a growing number of countries, ten as of 2016, are now classified as have excessive iodine supply in diet. In some areas, fortification or jump in iodine intake has seen increases in cases of toxic nodular goiters, after a certain period post-iodization, with fatalities resulting from cardiovascular complications in some areas. Individuals on thyroid hormone replacement medication often remain hypothyroid or become hyperthyroid which underscores the importance of monitoring. In regions with sufficient iodine in diet, thyroid autoimmunity is the most common dysfunction. This is confirmed through the presence of thyroid-specific autoreactive antibodies. The two well known dysfunctions are Graves disease (an overactive thyroid when immune system attacks the gland), Hashimoto thyroiditis (an underactive thyroid when immune system attacks the gland), and post-partum thyroiditis (an abnormal thyroid hormone levels after pregnancy). Grave’s disease: hyperthyroid with an overactive thyroid in which immune system attacks the gland. Key symptoms include a much diffused and swollen goiter, thyroid red eye disease in 20-30% cases, and rare cases localized thickening of skin and thyroid acropachy that manifests as swollen hands and clubbed fingers. Thyrotoxicosis, excessive thyroid hormones, from the iodine-rich compound amiodarone is more common in iodine-deficient areas but have a 3x higher prevalence among men. Graves disease is the most common cause of thyrotoxicosis in pregnancy, although other causes, such as toxic nodules and goiters, are known to occur during pregnancy. 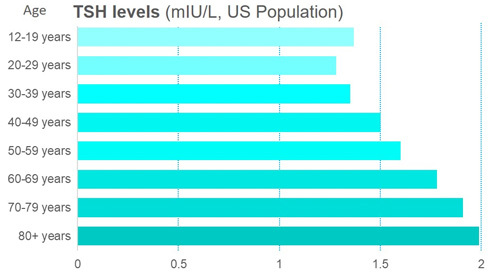 Nodular thyroid disorders are more prevalent in areas where iodine deficiency is more common, while autoimmune thyroid disorders, including Hashimoto thyroiditis and Graves disease, occur more frequently in iodine-rich populations. Thyrotoxicosis from the iodine-rich compound amiodarone is more common in iodine-deficient areas as more patients supplement iodine using this compound. Not all testing is equal and may not be always necessary despite increased awareness, lower cost and easy access; e.g., 2017 trial of thyroid hormone therapy for elderly patients with subclinical hypothyroidism (the TRUST trial, Scott 2017), found that up to 60% of potentially eligible elderly individuals with an elevated TSH had returned to normal euthyroidism with healthy hormone levels when reassessed for the trial. Why a TSH test alone is not enough? Since TSH is only one part of the HPT axis, full cycle of thyroid hormone circulation can not be completely understood with TSH alone. It is a first step to identify potential issues. But to understand the subclinical or mild form of hypothyroidism or hyperthyroidism, testing for T4 levels is necessary. Similarly, an immune attack on thyroid glands can be proactively assessed by checking the TPO antibody levels.